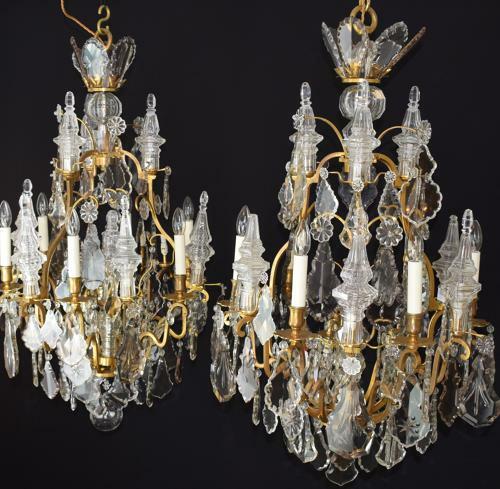 A fine pair of Henry Vian Louis XV style cage form chandeliers with the original gilt finish, electrified internally underneath a large central finial which in itself is also lit internally. The outswept arms also lit with electrified candles. The chandelier is hung with large tinted smokey cut plaques and clear glass plaques of varying styles from the 18th century. Stamped to the central hanging loop by the renowned maker, Henry Vian. Henri Vian (1860-1905) was a celebrated Parisian bronzier, specialising in the production of bronzes in the eighteenth century style and interior ornamentations of great quality. His output was concerned principally with the production of light-fittings but also included other bronze items. Such was the quality of his work that his casting and gilding can often be mistaken for earlier eighteenth century works of art. He participated in the Great Exhibitions of 1878, 1889 and 1900, receiving a Gold Medal in 1889. As a member of the jury with a status, hors concurs, a measure of excellence, he was prohibited from competing in 1900.